The day I need to bake a recipe using metric, my scale battery gives out. Radio Shack, here I come — and maybe I’ll bring you cookies! “Hello, Radio Shack kids behind the counter who are always so helpful in assisting with my peculiar type battery needs. Would you like to try my chocolate cookies? They’re made with mustard.” Okay, that would be awkward, but I need some tasters. The cookies are good, but different. The best I can describe them is “sharp”. They’re chocolate cookies with an edge; not spicy or heat producing, just kind of, oh, I don’t want to say “metallic” because that’s not complimentary, but the mustard boosts the bitterness in the chocolate so the flavor lingers on your tongue for a while. This recipe was sent to me by Colman’s, makers of the fine mustard powder you use in macaroni and cheese. Transfer that lift it gives the cheddar to chocolate and you have an idea of what it does for cookies. As far as texture goes, they’re fat, fairly soft but dense, and not very sweet at all. In fact, I added chocolate chips to the original version and would do it again because the cookies need the added sweetness and moisture. Obviously, this recipe was developed outside the US — the clues being the self-rising flour, caster sugar and the margarine (England’s margarine is trans-fat free, am I correct?) and the metric. But I did manage to add volume conversions and they worked out. For the flour, I actual self-rising flour, which I keep in the deep freeze for biscuit making and all these other recipes with self-rising flour I’ve been collecting. If you don’t want to deal with finding self-rising flour (or metric, for that matter), no worries. Colman’s has another version of the recipe that’s more Americanized. It’s completely different and I didn’t see it until after I’d made this one, but here are the Chocolate Spice Cookies on Colman’s USA. The recipe below and on the link (Colman’s Spiced Chocolate Cookies) was sent to me by their PR agency. 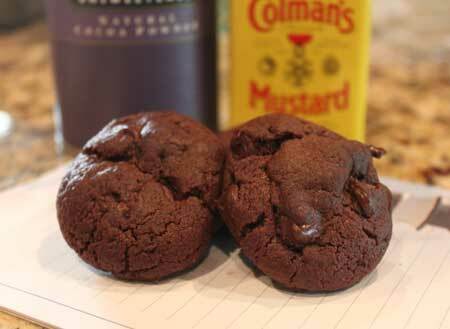 Mustard Spiced Chocolate Cookies — Recipe Halves Easily if You’re Not Sure….. 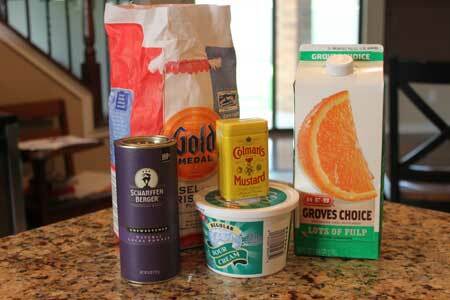 Beat together butter, sugar, yogurt (or sour cream), orange juice and mustard. Sift (or just mix) cocoa powder and flour and add to the mix, stirring to a soft (mine was pretty stiff, actually) dough. Form into smooth walnut-sized balls, arrange on a baking sheet and bake for 12 minutes**. Set oven at 375 deg. F, 190 deg. C or Gas mark 5. Cool on a wire rack. Makes about 45 cookies. **Original recipe said 15-20 minutes, but the cookies would have dried out. ** If you don’t weight your flour, fluff it up well before scooping and leveling smooth. If you use too much flour, the cookies will be dry. This comment is for Susan, who asked a question about heavy cream. Susan, I tried to email you but your email didn’t work, therefore I cannot email you back or publish your comment. To answer your question, the recipe on Colman USA site is completely different than the one I used and calls for chopped chocolate rather than cocoa. It looks like they either left out the cream from the ingredient list or meant to say dissolve the mustard in the creamed mixture, but that’s a stretch. Wish I could help you more, but I made the recipe from the European site. Sorry. ok i must try this. if you say “sharp” then i must try them. I like when there is a secret ingredient you can detect, but no one can figure out! Brave to put mustard in a cookie and lucky to have it not be disgusting! Mustard and chocolate is a combo I never would have thought to bring together! I love what mustard does in savory dishes so I’m intrigued by this. I’ve seen a lot of chocolate chip cookie recipes before, but this one is definitely the most unique. Who would ever have thought that mustard could make for such delicious looking cookies? That’s definitely an interesting one! My husband LOVES mustard, maybe I’ll surprise him sometime and see if he can figure it out.